This is the third year that my family and some our close friends did a vacation together. Two years ago it was Culebra, Puerto Rico. Last year it was New Providence in the Bahamas. This year, traveling in April instead of February, we decided to do a road trip to the Outer Banks of North Carolina. To get there we would need to get out of New York, through New Jersey into Delaware, and then on through Maryland and Virginia until finally reaching our destination. We broke the drive down into two segments: from New York to Delaware on 31 March and from Delaware to North Carolina on 1 April. To keep the drive from being too monotonous we decided to make stops along the way and because everyone in our vacation crew likes the outdoors we hit some pretty birdy places. First, on our way to the Cape May-Lewes Ferry, we were running a little bit early so we made a brief stop at the famous Cape May Point State Park. 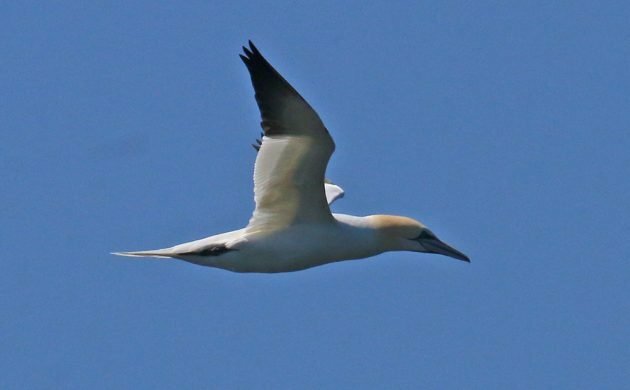 The sun was out, the birds were singing, and I got to point out Northern Gannets patrolling offshore. 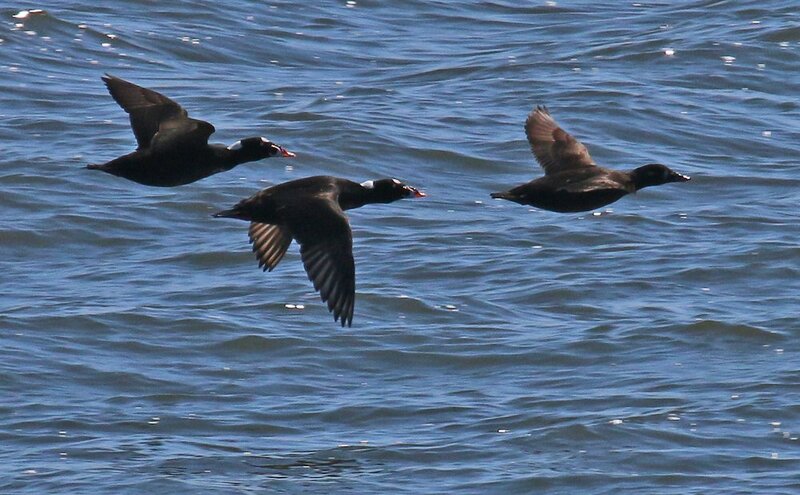 Then on to the ferry where in addition to more Northern Gannets and the delicious Bloody Marys served at the ferry’s bar that the non-drivers of the group enjoyed, we saw loads of Surf Scoters and Black Scoters, to say nothing of Red-throated Loons, Laughing Gulls, Common Loons, and Osprey. 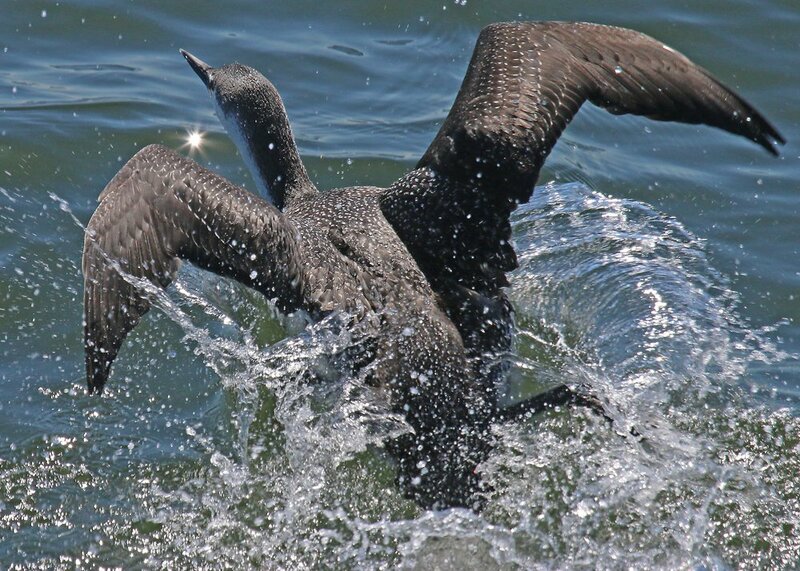 This Red-throated Loon barely managed to avoid being squished by the ferry. We got off the ferry and, seeing as we only had about half-an-hour to drive before we were at our hotel, we decided to explore a bit at Prime Hook National Wildlife Refuge. A nice walk on the Boardwalk Trail and the Pine Grove Trail didn’t net us a ton of birds (twenty-five species in forty-five minutes) but we all appreciated being out and about in the great outdoors. The next morning I was up and out early in the morning as we were planning on continuing our trip at 10 AM, which gave me time to once again explore Cape Henlopen State Park. Instead of being around for breeding birds like my last visit I would be focusing on migratory species and Cape Henlopen delivered with forty-six species in an hour-and-a-half of birding. 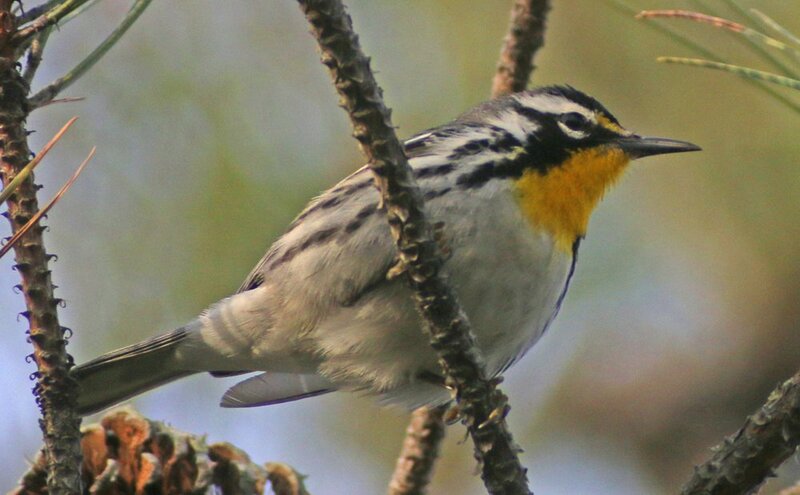 The easy highlight for me there was a Yellow-throated Warbler which foraged in some pines, completely unconcerned about my presence. What’s not to like about Yellow-throated Warbler? 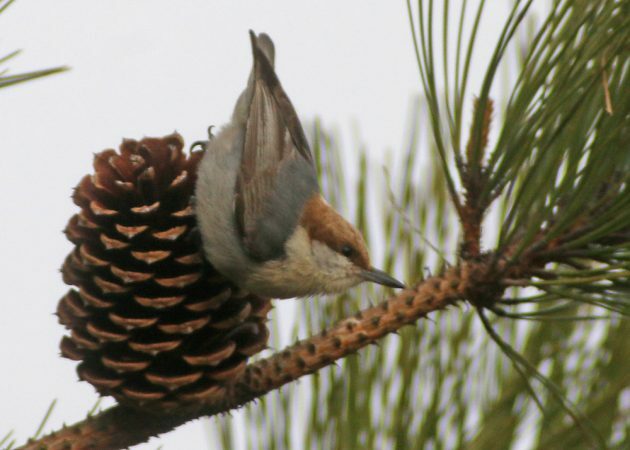 Almost as cool for this New Yorker were the Carolina Chickadees and Brown-headed Nuthatches. These year-round residents, specialties of the southeast, don’t get to New York now but with climate change perhaps they will eventually? Nuthatches are always fun birds and being able to watch them for extended periods is always entertaining. 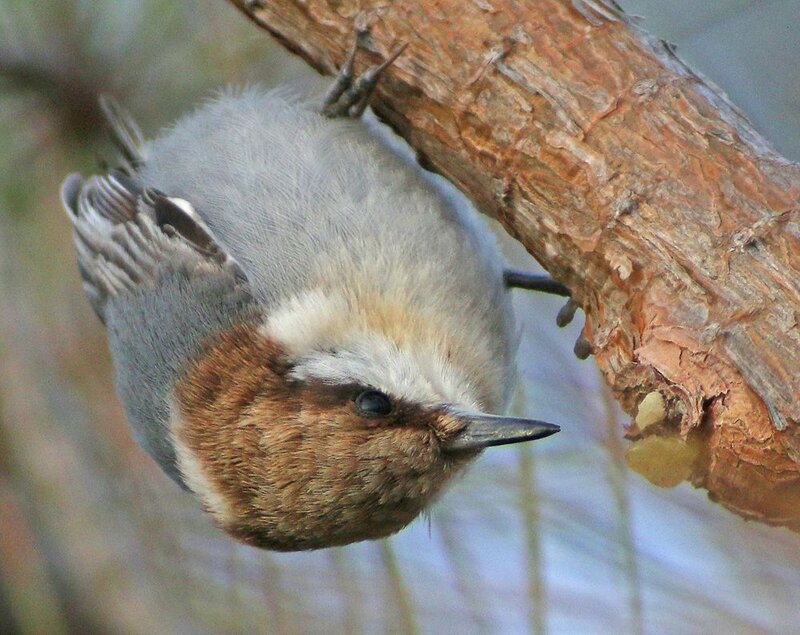 Upside-down, right side up, it doesn’t matter to Brown-headed Nuthatches. As we headed south I started entering the occasional eBird checklist as we worked our way out of Delaware and through Maryland. It’s entertaining and a fun way to get a bunch of county ticks. 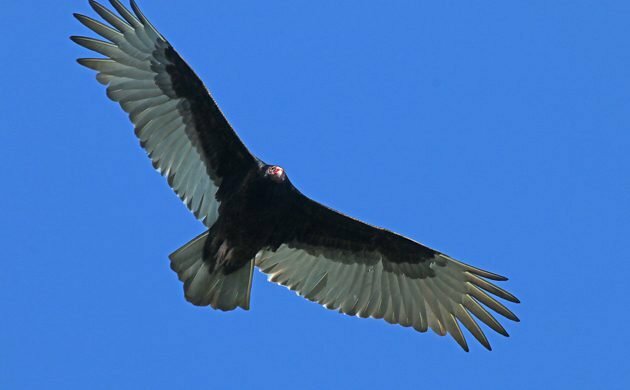 I think I’ve recorded Turkey Vultures like the one at the top of the post in most of the counties of the eastern seaboard at this point! But much more entertaining was my first visit at Chincoteague National Wildlife Refuge where a mid-day visit that was also an hour-and-a-half long totaled forty-three species. 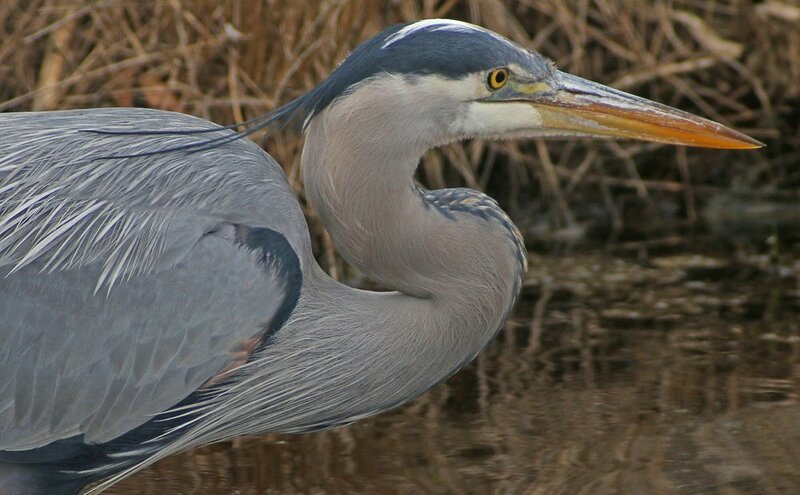 Everyone oohed and aahed over this very close Great Blue Heron. A quick stop at a seafood shack on our way back to the highway was much appreciated, as were the gannets, scoters, and gulls we spotted as we crossed the Chespeake Bay Bridge Tunnel though that feat of engineering is much less endearing to birders now that the rest area on the bridge is no longer open. The rest of our ride to the Outer Banks was uneventful, though I did enjoy entering some more mobile eBird checklists. Come back soon to learn what I managed to see during our time in the Outer Banks! And feel free to leave additional recommendations for good birding stops on the drive between New York and North Carolina. Because we all enjoyed our trip so much we might do it again next year!